Here my vid tutorial. Enjoy!! Check out episode 9 of my playthrough it's a good one and well worth the watch! Feedback is also greatly appreciated! A new Don't Starve series! My very first Let's Play/Playthrough ever! Hey guys, my name is Phil and im a brand new youtuber. I've decided to start my very first series on Don't Starve, and was hoping to get some feedback on it. Any feedback on how I can improve is much appreciated thank you. I was making a Don't Starve LP when fraps wasn't working. I had skype on so i closed it. But then i still have problems PLZ HELP! My first gameplay on YouTube! I am assuming this is inactive? Since the last time it was posted on was 2012. 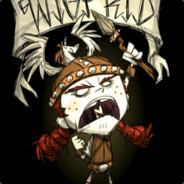 My second Don't Starve Series starring Wendy, The Bereaved! Hey guys, my friend and I have a YouTube channel and I started a series of Don't Starve. The first series was with WX-78, which is on the channel if you're interested, but I died fairly quickly and I think this series is stronger. So here it is! Episode 1!